The Hyundai Sonata has become a popular family sedan with more than 62,000 sold in the U.S. last year. And Hyundai has become a major player, selling more cars in the U.S. last year than Mitsubishi, Mazda, Mercury, Saturn, BMW, Mercedes, Cadillac, Lincoln, Lexus, Acura, or Volvo, to name a few. The reason for its popularity is that the Sonata offers a strong value, a concept that includes price but also factors in product quality and features. And Hyundai has come a long way, baby, in terms of the quality and features its vehicles offer. The Sonata is a midsize four-door sedan that, were it not for its badge, could be mistaken for competitors selling for thousands more, and with features that on many other cars would cost thousands more. Hyundai has greatly improved the quality of its product and backs that up with an industry-leading 100,000-mile powertrain warranty. 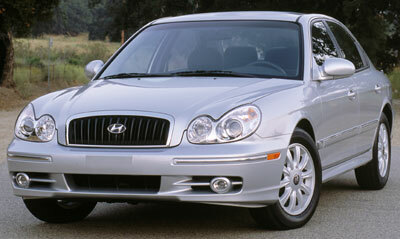 Three models are available: Sonata ($15,499); GLS ($16,999); and new for 2002, the LX ($18,324). The base Sonata is surprisingly well equipped for its price, coming standard with air conditioning, AM/FM/CD audio system, rear defroster, power mirrors, power locks with keyless remote, power windows, cruise control, remote fuel door and trunk releases, 60/40 split folding rear seat and variable intermittent wipers. A 2.4-liter four-cylinder engine is standard, as is a five-speed manual transmission. GLS is a V6 model with a higher level of interior trim, including deluxe cloth upholstery and better carpet, leather-wrapped steering wheel, an improved center console, dual map lights, and rear cup holders. It also comes with heated mirrors and a power antenna. GLS is powered by a V6 engine and comes equipped with four-wheel disc brakes. LX is the luxury model, and comes with leather seating surfaces, automatic temperature control, and an eight-way power driver’s seat. Traction control and anti-lock brakes (ABS) are optional, and come as a part of a package that includes a sunroof ($1,250). The sunroof ($550) is available as a standalone option. The Hyundai Sonata is strikingly handsome. The design is expressive without being oppressive, with graceful lines and features one would expect on a much, much more expensive automobile. Overall the Sonata has the feline lines of a Jaguar sedan; the headlights could be a Mercedes-Benz element. The waterfall grille is formal without being pretentious. Chrome trim around the grille, over the doors and on the trunk is well placed, and like jewelry tastefully worn, it enhances rather than distracts. The headlights are more than cosmetic. The small low-beams are not the blue-tinted xenon lamps, but halogen projector lamps that produce a uniformly bright pattern that’s complemented by very bright high beams. Good headlamps are extremely important, especially on dark and stormy nights, and the Sonata’s are excellent. The Sonata’s pull-type door handles feel solid and don’t feel like they’ll break when you need to pull open a door frozen shut. It unlocks easily via the keyless remote fob, of course, and the doors close with a solid thunk. A driver’s hands should be on the wheel all the time when driving, and Hyundai has graced the Sonata GLS with a steering wheel with buttery soft leather. It’s indicative of the attention given to details of the Sonata’s interior. The ignition switch is on the dash, rather than plugged into the steering column. The front seats are broad, for maximum comfort, lightly bolstered but not really enough for sporty driving, appropriate for this sedan. Different colored vinyl is used on upper and lower dash, and the plush fabric used on the seats is repeated in door panels. The GLS also has a two-compartment center armrest. Around the center stack, the GLS gets a splash of artificial wood that will fool no one but oddly enough is appropriate for this model. A frame of burnished aluminum around the automatic shifter frames a standard PRND quadrant, with a Shiftronic slot alongside. Only the ashtray feels flimsy. The glovebox opens with a firm feel. The rear seat folds 60/40 allowing long items to pass through from the trunk. With the seatbacks in place, there’s a bench contoured for two passengers but with three-point belts for three people. The seatback includes a folding center armrest. Map pockets are provided on the backs of the front seats. The back seat offers good room for two adults, with sufficient legroom and comfort for a long trip. For 2002, Hyundai has provided electric switches for the trunk and fuel door release. The power releases are easier to reach and operate, and are placed on the driver’s door. The trunk itself is large, at 14.1 cubic feet. Articulated trunk lid supports stay out of the trunk: no more crushed groceries from or luggage in the way of traditional trunk lid hinges. The Sonata GLS drives like a midsize family sedan. The V6 idles quietly but with sufficient vibration that one won’t be tempted to start an already running engine. There’s enough torque from this engine for a quick getaway, and the Sonata accelerates smoothly and without great drama. There are times when you’ll want more power than the 2.7-liter V6 can deliver, such as merging into fast-moving traffic from a standstill. With 181 horsepower, however, it’s in the same ballpark with the Toyota Camry V6; actually the Hyundai V6 produces more power per liter. The Sonata weighs approximately the same as the Camry. The net result is that a Sonata GLS will lose drag races against a V6-powered Camry, if that matters. The automatic transmission really matters more, and it is actually quite sophisticated. Using fuzzy logic, the transmission’s electronic controller automatically adapts to the driver’s style and minimizes hunting when climbing hills. Shifts are smooth, and the best thing one can say about it is that it isn’t noticeable, which is how an automatic should behave. It does such a good job in the automatic mode that it makes using the Shiftronic feature superfluous. With Shiftronic, the driver may move the shiftlever to a second slot, and once there move the lever fore and aft to shift up and down on gear, the transmission then holding the selected gear rather than shifting automatically. Those who live in a hilly area might find it useful for engine braking on long and steep downgrades. Everyday driving yields a benign demeanor. The ride is freeway smooth, thanks to a fully independent suspension, soaking up everything from tar strips to potholes with equanimity. Some popping over seams can be heard, and at speed there’s a tendency for the Sonata to drift within its lane. However, the Sonata glides effortlessly on the Interstate at 75 mph with only a ruffle of wind noise and the slightest amount of tire noise interceding. One can enjoy even the pianissimo sections of classical music coming from the CD player. On the other hand, as noted, the Sonata is not a sports car, and pressuring it to do something in a corner that one shouldn’t ask yields a classical exposition of understeer (the front end pushing or plowing) that one would expect from a family sedan. It’s safe and predictable, and even if it won’t corner like a Formula 1 racer, at least it won’t give its driver any nasty surprises in the twisty bits. Braking is solid with the four-wheel discs that come with the V6. Our Sonata, however, did not have the optional ABS/sunroof package. The Hyundai Sonata warrants consideration from family sedan buyers on a budget, or who appreciate good automotive value. The Sonata is a distinctively handsome family sedan available for thousands of dollars less than most mid-size cars. Hyundai is making great strides at improving quality, and the Sonata comes with an impressive 10-year/100,000-mile powertrain warranty and 5-year/60,000-mile bumper-to-bumper coverage. Head/hip/leg room, f: 39.3/55.8/43.3 in. Head/hip/leg room, r: 37.6/54.4/36.2 in. Cargo volume: 14.1 cu. ft. Copyright © 1994-2018 MH Sub I, LLC.